Mike Huckabee brought his low-budget campaign to College Station, Texas today and wowed an overflowing auditorium filled primarily with Texas A&M University college students with his populist conservative message. I certainly expect Texas’ young conservatives to be out in force Tuesday if their response to today’s speech is any indication of their support for him. For them – and for many of the rest of us – Mike Huckabee is the only choice they can make without compromising some important principles. There is no second option because, despite John McCain’s recent conservative conversion, no one else represents conservative values of smaller government, balanced budgets, lower taxes, individual responsibility, and the sanctity of human life. Mike Huckabee is the only one who holds these values and he’s the man who deserves our votes next week. The fact that John McCain may be more electable in the general campaign is unimportant. Our principles matter, as does the demonstration of those principles. Show them and politicians who are willing to embrace them will appear; hide them and our choices will be limited even further. The university, which is my alma matter, College Station, and Texas are all tailor-made for Huckabee and his vision of personal and moral responsibility. People here are more conservative by nature, naturally reluctant to embrace government as a savior or even a safety net, and sure of themselves and God than almost anywhere else in the U.S. There is something different about Texas, however elusive that difference can be to define. One truth that Huckabee knows is that Texans don’t like it when outsiders try to tell us how things are going to be. Huckabee joked that what he’d really like to see is the talking heads in the media sitting around after the polls close on Tuesday scratching their heads and admitting that they don’t know how he did it but Mike Huckabee has defeated John McCain in Texas. "The smart thing to do is pick someone who believes that it is not the purpose of government to fix us, it’s the purpose of us to fix the government." Right on. Listening to Hillary Clinton’s array of proposals to jump-start American innovation in the green energy sector, I have to admit being inspired by her vision. But the reality is that change happens in its own time, when the time and opportunity are both ripe, not when a charismatic politician begins to talk about it during an election cycle. True, words can act as a catalyst, but when the initial burst of inspiration as fuel is burned up the process of change is unable to continue on its course because it’s momentum was artificial and the resulting inertia insufficient. That’s the essence of the problem with Hillary’s green energy plans and it’s the problem with Barack Obama’s empty words. Markets and opportunities are not created by taxing and spending – they’re created by demand and when green energy is demanded by consumers it will flower as an industry but will struggle until then. During the speech Huckabee spoke at some length about his Fair Tax plan and received a thunderous ovation. It may very well be that my taxes will go up under Huckabee’s plan. I don’t know if that’s the case and the truth is that I don’t care. A simple, fair tax system that citizens understand is more appropriate than one that is so complex that even the I.R.S. has difficulty interpreting their own rules. 67,000 pages of tax code? Please! 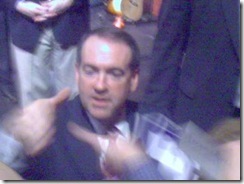 Speaking about his position as a conservative, Huckabee said that he makes no apologies for being a conservative. "The most important challenge is that we move this country vertically, to make sure it goes up and not down." The change the Democratic candidates are promising is not better but is instead expensive. The promises already made by one unnamed Democratic candidate will cost over $300B to implement. "Remember, when government does something for you it first has to take something from you." Also true. Even the most liberal citizen must admit that the government creates no revenue on its own. It has no sales and no customers. To provide a benefit to one person it must take something from someone else. It’s that simple and, frankly, that wrong when taken beyond the minimum necessary level. "You aren’t elected to the ruling class, you’re elected to the servant class"
That’s something the Democratic candidates have long since forgotten and their solutions, which always seem to center around the idea that they know better than the people they govern how our individual resources should be managed, reflect that. While I respect John McCain and will vote for him if he gains the Republican nomination, I still believe that Mike Huckabee is the president that America needs in 2008. Facing a do-or-die primary in Texas, Hillary Clinton delivered a great speech at the Houston Presidential Energy Summit tonight. I was there and thought she did a terrific job even though the audience was probably smaller than she’d hoped to see in the 4th largest city in America. From the 4th row, Hillary – who arrived at 7:30 PM, 1.5 hours late – looked and sounded energetic at the end of a long day. The campaign trail has been difficult for her lately and the once-inevitable fact of her election has been reduced to something rather less than probable. Still, Hillary was the only major candidate to speak at the Summit held in the city that many call the energy capital of the world (Ron Paul was here earlier). This commitment, kept after starting her morning in Ohio, demonstrates to me once again that she is a more discerning, capable, and practical candidate than Barack Obama. In truth, both candidates could do better when it comes to placing the proper degree of importance on energy policy. As Loren Steffy of the Houston Chronicle notes, energy has not been a major topic of discussion among the candidates for the Democratic nomination. Republicans have done a better job of acknowledging the obvious link between national security and a stable energy supply. Hillary’s speech was targeted to the energy industry audience that had paid to attend the summit and focused on the similarities between the aerospace industry and the immeasurably important role it has played in the development of the American high tech industry and the new challenges faced by the energy industry. Differentiating herself with Obama regarding space exploration, Clinton said that she would accelerate development of the space shuttle’s replacement to ensure that America continues to lead in space and does allow "a ten year period in which Americans will have to hitch a ride from Chinese or Russian-made vehicles". That’s a great decision to make because it shows that she understands what real hope is: the dream of moving forward and the opportunity to do so. In contrast to her opponent, Hillary Clinton in person is a figure that makes you believe in her because her vision of hope is one of working toward a better future and her idea of change is the end result of years or even generations of n nation rolling up its collective sleeves and simply making it happen. America must take the initiative in the energy industry, Clinton says, because energy security is essential to our nations future and that of our children. We face challenges in regard to our economy because of high energy prices here and now, in energy security because we are importing the vast majority of our oil, much of it from countries whose interests could not be less aligned with ours if the devil had planned it so, and in regard to the environment. "I think that we can all agree – finally – that climate change is a real threat," Clinton says. But is that really true? The science is not yet conclusive. Even so, Hillary clearly believes that it is and has huge plans to revolutionize the energy industry, plans that will cost a lot of money. To achieve her goals of reducing greenhouse gas emissions by 90% and cutting oil imports by 2/3 – Hillary would create a National Energy Council and do away with tax advantages currently enjoyed by energy companies. This money and more, to the tune of $50B, would, she says, subsidize the move to clean energy industries. She believes in the genius of America. She’s not afraid in discussing fossil fuels. She’s not afraid in discussing alternatives and renewables. She’s not afraid of Texas and Houston or the fact that we are the energy capital of the world. Proving that, Clinton told the pro-energy industry crowd that she was going to take a significant amount of money away from oil companies. She also challenged these business leaders to do more, to become true energy companies instead of merely petroleum companies, and to lead innovation by cooperating with the public sector and higher education with a sense of urgency. "We can do this," Clinton says, and when listening one can’t help but believe her. Now, back at the keyboard, it’s seems dubious to me that the Green Corps is going to do much to make American a healthier country. And the 5 million jobs that Hillary plans to create in the green energy industry seem to me to be funded more on the backs of the oil industry than on a sustainable demanded-driven momentum of their own. Cannibalization, in other words, and not sustainable. But when Hillary compares the importance of energy security – which is perhaps the most important issue facing America today – to the challenge Dwight Eisenhower faced when Sputnik was launched, it shows that Mrs. Clinton understands the true nature of what American is and how it should respond to a crisis. This, in contrast to Barack Obama’s promise of hope in the form of government solutions to private problems. Real hope is the chance to accomplish something important for one’s self, which is quite different than having the problem solved for you. Clinton and McCain both understand this. Obama, I think, does not. The world is changing and we will have to change with it. But the question is, do we lead the change or does the change lead us? You know, all this talk about change in our campaign leaves out a very important qualifier. Change is going to happen whether we do anything or not. So how do we both master change and ensure that the change which occurs actually produces progress? I believe that we can, with the right commitment, break the bonds of the old energy economy and turn this energy challenge into one of the greatest economic opportunities in our history. The enormous undertaking of creating a secure energy supply for the future will require a president who is willing to take on big problems with enthusiasm, who is determined, and will not stop short of an important goal. America’s brilliant success in space and high technology did not happen by hoping for it or by accident, Hillary says. "It happened because we made up our minds to do it." Period. We were talking about space and energy and I was struck by how he still has that twinkle in his eye as though he is that young astronaut that just broke down all of the barriers and lifted our hearts. There are so many young Americans waiting to be called to do the same, to give us the energy future we deserve. It is up to us to send out that call. Is is up to America once again to lead the way. Hillary Clinton is the better candidate for the Democratic party’s nomination. I had the chance to shake Mrs. Clinton’s hand after she finished her speech – one of the many benefits of working for such a notable publication as the PoliGazette – and in that moment I couldn’t help but think that, if not for the baggage that she carries with her, I would like to vote for Hillary in the general election. Unfortunately, both Bill and the Democratic members of Congress are still there, now that the spell has been broken. Harvard University has accepted a Muslim group’s petition to close the school’s Quadrangle Recreational Athletic Center to me for an hour a day so that Muslim women can work out without the presence of men in the gym. Men have not been allowed to enter the Quadrangle Recreational Athletic Center during certain times since Jan. 28, after members of the Harvard Islamic Society and the Harvard Women’s Center petitioned the university for a more comfortable environment for women. [Harvard Islamic Society’s Islamic Knowledge Committee officer Ola] Aljawhary said that she does not believe that the women-only gym hours discriminate against men. "These hours are necessary because there is a segment of the Harvard female population that is not found in gyms not because they don’t want to work out, but because for them working out in a co-ed gym is uncomfortable, awkward or problematic in some way," she said. Though the policy was in part initiated by the school’s Islamic group, Aljawhary said women-only hours are not a case of "minority rights trumping majority preference" and said women of different faiths have showed interest in the hours. That statement is, of course, not true. It would be easy to either write this off to an overly P.C. administration at Harvard or to genuine respect for women’s rights. Both, I suspect, are true in large part. However, a casual Google search reveals a pattern of similar cases at both public and private colleges across the U.S. that is too sizable to ignore. That pattern is one of Muslim students consistently failing to assimilate to the culture of this country. This failure should come as no surprise given similar but more overtly destructive examples of the same behavorial pattern all across Europe, most recently in Denmark. Rather than joining in the American melting pot, some American Muslims are deliberately using the administrative weakness of our institutions of higher education to promote their agenda of separatism. For this reason it is imperative that American universities – and Americans at large – stop accepting baseless claims of discrimination from Muslim groups, start making independent judgments about what is right and wrong, and consistently refuse to give in to these minority groups’ demands for preferential treatment at the expense of others. ABC recently placed actors "undercover" in a Waco, Texas bakery to observe Texans’ reactions to public anti-Islamic discrimination. Not surprisingly, the outcomes ran the gamut from Islamophobic to outstanding personal behavior. "Get back on the camel and go back to wherever you came from," he said. "You got that towel on your head. I don’t know what’s underneath your dress. Just please take your business and go elsewhere with it." "Sir, would you mind ordering me an apple strudel? That’s why I am here," Sabina said. Legally that debate was settled long ago as part of the civil rights movement; however, in the hearts and minds of many Americans the freedom to discriminate based on arbitrary preferences remains a powerful force. Which – however offensive personal choices may prove to be – is as it should be. No government can make me like people with red hair if I am phobic about hating them; any attempt to legislatively mandate my love for them is foolish and doomed both to fail and diminish the people’s perception of the government’s authority, moral and otherwise. That said, Americans are arguably the most blessed people on Earth simply by virtue of the accident of their birthplace. Is it so difficult for us to rise above our fears – fears which are, in truth, partially justified – to treat Muslims as we would want to be treated? Not for everyone, as ABC demonstrates. In the matter of personal ethics it seems best to error on the side of courtesy rather than rudeness when in doubt. That’s as true as ever, even though violent Islamic attacks on U.S. targets and pictures of Islamic anti-western demonstrations have increased that doubt significantly. Of course, this courtesy is assumed to be obligatory for all parties, regardless of race, religion, or color – Muslims included. Those who expect westerners to conform to Islamic codes of conduct when in a Muslim nation should return the favor by assimilating peacefully into other countries when abroad. Failure to do so is the point at which common courtesy ends. Barack Obama closed tonight’s Democratic debate saying that he’d participated in 20 debates with Hillary Clinton and that he had no doubt that Hillary Clinton is a capable, competent candidate for the office they are both seeking. Obama’s tone said that he’s tired of the debate process and has had enough of it. As well he might be. Hillary got the better of him this evening, albeit with a little help from MSNBC’s moderators who pinned Obama down like an entomologist sticking a butterfly to a mounting board on the subjects of Louis Farrakhan’s endorsement of him and his waffling on his promise to accept public funding of his presidential campaign upon winning the Democratic nomination. Obama’s normal eloquence failed him as he did not respond adequately to either question and even left himself open to Hillary’s quite precise – and accurate – observation that Obama’s previous distancing of himself from Farrakahn was not equivalent to rejecting his endorsement in the here and now. Obama was forced to agree, though to his credit he did so with a grin. It’s open to debate how much the public funding question matters. While McCain might hammer away at an Obama turnabout on this issue, my instinct says that this is not something that voters care about. It’s an inside-the-beltway legalism that neither cuts taxes nor provides additional government largess – few care outside the media and blogosphere. Still, watching Obama squirm on the hook was enlightening. I think the man is a genuine believer in what he’s selling, that he doesn’t like to lie, and that he is going to do everything he can to make his agenda of directing the American government to the benefit of the middle and lower classes during his administration. In addition to sticking Obama on the Farrakahn issue, Clinton did the right thing by saying that she now regretted her vote for the Iraq invasion, something that’s a no-brainer given the events of the last 5 years. Meanwhile, Obama boldly stated that he would re-commit troops to Iraq after withdrawing them in the event that al Qaeda, et al, resurfaced there. That I don’t get. Although the Iraq war was a horrific case of misjudgment, we are there now and have invested upwards of a half trillion dollars while causing the deaths of thousands of Iraqis and destroying their country’s infrastructure. We are honor-bound to do right be them, regardless of how we got to this point. That both Obama and Clinton would immediately withdraw from Iraq demonstrates their party’s fundamental lack of suitability to lead America at this time. At least Hillary had the sense – or good fortune – not to be the one to say that she’d go back into Iraq after prematurely exiting. Final analysis: Hillary closed the debate well and demonstrated that her ability to think on her feet is far superior to Obama’s. Unfortunately, I think it’s too little, too late. Obama, to the soon-to-be detriment of the U.S., has it all going his way now and one debate on a 2nd-rate cable TV station isn’t going to change that. Corn [prices] doubled in the past two years, touching a record $5.29 a bushel today in Chicago. This has been a well-publicized problem in Mexico for over a year now and the corn price increase there and elsewhere is only going to get worse as more U.S. production is turned into fuel. The sad fact is that ethanol is significantly less efficient than petroleum products. While ethanol provides a short-term buffer against higher oil prices, the Bush administration is forcing America to rely on product whose production cannot be sustained long-term. The next administration would be wise to slow investment in this technology in favor of nuclear and hydrogen power sources as these should provide more benefits in the long-term. Ezra Klein gets his response to this article by Alex Steffen about as wrong as he possibly could. the amount of density the study’s authors call for is extremely modest. They encourage building new projects at a density of 13 homes per acre, raising the average national density from 7.6 units per acre to 9 an acre. denser areas are also more livable. They’re more walkable, which is shown to make people healthier, and more social, which is shown to make them happier. But, of course, policy would need to undergo pretty significant changes to prize density. And we can’t have these damn liberals using their social enginnering [sic] to take away our garages. There’s often a tendency to assume that the status quo is the most "natural" way for things to be, and that rejiggering the relevant subsidies is somehow more artificial and presumptuous. What Klein calls the relevant subsidies are the home mortgage interest deduction. Certainly this has a direct impact on whether people can afford to buy a home and how much they’re able to pay for it. But these incentives have nothing to do with the flight to suburbia and everything to do with the desire that people have to escape the kind of cheek-to-jowl urban prison that Klein and Steffen champion. An acre is 43,560 square feet, so 13 homes per acre allots a plot of land that’s less than 60 feet on a side to each home. Assume a 30′ by 50′, 1500 square foot home and you’re not left with much in the way of surface area for the kids to play in, etc. Not a situation that most families would choose to be in, given the means and a free market. Evidently what upsets Ezra is that there is a means-based test to determine who is fortunate enough to escape the inner city that Steffen describes as having a population density of 36-160 homes per acre. Indeed, there’s nothing natural about our current settlement patterns, and no reason preserving them should be seen as a nod to expressed preference rather than, as it actually is, a status quo bias in favor of the current subsidies and their associated winners. Actually, it’s entirely natural. People who possess the ability to earn the means to live as they choose do so, period. To stop this "destructive" behavior, the government would have to create disincentives to keep families from freely living in the best way they can. Now that’s unnatural. I’ve been asking around, where can I get MP3s of all the conference calls, the day they happen, in full, not spun through the reporters, and so far have come up with nothing. So I’m bringing this issue to as many people as I can think of who might either know how I can get them, or apply pressure to one or more news organizations to make them public. Conference calls are one small aspect of the process. But Dave’s desire to have access to the raw facts in the absence of spin and interpretation is one that I think deserves attention. The technology exists such that the media layer is no longer necessary in the distribution of news. The MSM is still a useful filtering device. But it gets less important every day as independent voices gain respect and weight. Envision a clearing house in which politicians’ statements are aggregated into a distributed master index that becomes the public record. There’s no reason why this shouldn’t happen in the next few years. Hillary explained, in an email response, that she gets a lot of email and can’t respond to each one individually. Then she listed all the ways I could help her campaign, including giving her money. That’s a pretty incompetent way to respond to a press inquiry. One professional reporter explained that they don’t publish press releases so why should they make the MP3s of the conference calls available. Oy. They clearly don’t understand that as voters we might have an interest in unfiltered access to the actual words of the campaign. It never occurs to them, apparently, that not every voter sees their spin as a total value-add. Four years from now we’ll look back at this in amazement that there was a day when campaigns hid their words and ideas behind the filters of the press. That’s totally correct, or it should be. Part of the hold up on this relatively simply technology issue is that the MSM does understand that many people see their obfuscation layer for what it is. Denying access to the raw source helps preserve their empire. Temporarily. I don’t often agree with the aims of the ACLU, but I think that filing a suit against the Bush administration’s use of "unapproved", to put it gently, wiretapping was a good thing. Today the U.S. Supreme Court declined the opportunity to hear the case. Short-term it’s irritating that the SCOTUS dodged this case. It’s my opinion that warrantless (illegal, in most people’s definition of the word) wiretapping has gone too far and that the government needs to redraw its boundaries as relates to unsupervised access to citizens’ private conversations in all forms. The SCOTUS could have clarified matters significantly by hearing the case. But there is benefit to pushing the matter back to Congress, the body that has failed to act to rein in the Bush administration’s excesses in this area. Democratic leaders should abandon the farce over whether telecom companies will get amnesty for their post 9/11 acts – they should and will, in the end – and concentrate on making sure that some semblance of due process and judicial review is put in place to control the government’s access to private information. Seldom have I heard a politician (or his or her partner) speak in such an incredible arrogant manner. For the first time in her adult life? Because her husband may win his party’s nomination and after that the general elections? Considering the nature of liberalism, its massive wealth and income transfers, over-regulation, and agenda-based politics, a vote for Obama is a actually vote against hope. What hope is there in voting yourself a welfare entitlement from the government? From the economic and individual responsibility perspectives Obama represents the exact opposite of hope. Socially, being a black male, Obama’s success is indeed something that all Americans who have voted for him – as well as those who could vote for him if his policies were wiser – can be proud of. But at what cost?